A wide-ranging, cross-country wolverine, a moose in a glacial crevasse and the bear that went in after it - researchers strive to learn what most animals in a population do most of the time, but sometimes it’s the unusual behaviors that stand out. Bears, mountain goats, moose and wolverines in the rugged coastland north of Juneau have been the subjects of a unique multi-year study by state wildlife biologists. The core of the study area is the estuaries and river bottomlands of Berner’s Bay, the surrounding ridges and mountains, and the steep, glacially carved mountainsides of Lynn Canal. Plans to build a road through the area provided the impetus and funding for the study, which began in 2006. To understand the effects that increased public access to the area might have on wildlife, and the impacts of the road, wildlife managers need baseline data. Some aspects of the research have been recently published; others are on-going but have been scaled back. Researchers learned a tremendous amount about the animals in this area, their selection and use of habitat in different seasons, and how, when and why they move between these areas. An added bonus is that many of the insights learned in this project can be applied elsewhere. “What we learned transcends the Berners Bay/Lynn Canal ecosystem and can help us in many other ways, specifically with management and conservation throughout the region,” said Kevin White, one of the principal researchers. 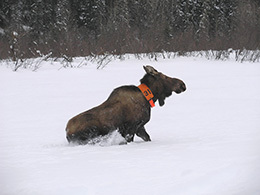 Another benefit is improved survey techniques for estimating numbers of moose, bear and mountain goat, which can be applied to other populations. 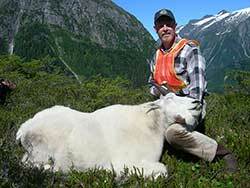 Mountain goat populations in Southeast Alaska are assessed using aerial surveys, and research in Lynn Canal helped fine tune aerial survey techniques enabling biologists to more accurately estimate mountain goat population abundance and trends. At the other end of the spectrum, given the densely forested habitat in Southeast Alaska, brown bear populations are difficult to estimate by aerial survey. The Berners Bay study also provided a better understanding of new data collection tools, especially collars equipped with GPS devices. The collars enable researchers to track and map animals’ movements through different habitats at different times of the year. Detailed maps of goat movements made over months and years chart the locations of nannies (females) with kids, maturing adolescents, and full-grown billies (males) as they court, mate, have young, fatten on summer ranges and endure harsh winters. Collars reveal where bears eat grasses in spring, catch salmon in summer, and den in winter; how extensively wolverines travel, and differences in behavior between male and female animals. In some cases, the collars revealed some remarkable and weird stories. In the fall of 2006, White and his colleagues equipped a mountain goat with a GPS collar. The goat died during the winter and deep snow prevented biologists from retrieving the collar. The following summer, a black bear scavenged the goat and managed to “put on” the dead goat’s collar. Researchers then tracked the bear for more than a year as he crossed glaciers and ice fields, climbed ridges and descended into remote valleys. In another case, three sets of data from three collars all intersected. Two moose were killed in avalanches, and another fell into a glacial crevasse. That precipitated an unusual follow-up – the moose was wedged part way down the crevasse, and a hungry brown bear attempted to scavenge the carcass. The bear lost its footing and also fell to its death into the crevasse. One collared wolverine also provided an unusual story. Researchers were unable to locate the animal after collaring it in April 2008, despite repeated attempts ranging as far south as Juneau. Seven months later, a trapper caught the animal up the Iskut River in British Columbia, a tributary of the Stikine River, about 330 kilometers (205 miles) distant. Wolverines are notoriously difficult to capture and study. One far-reaching benefit of the Berners Bay project is improved techniques for capturing these elusive animals. Motion-triggered cameras were placed at trap sites and provided insights into animals’ behavior at the traps. Fifteen wolverines were captured and 12 (six males and six females) were equipped with GPS collars. Males had an average home range of 521 square kilometers (323 square miles), seven times larger than that of the females. Mountains goats are a big part of the project, and the Kensington mine (located within the study area) contributed additional funding to continue goat research. Seventy five nannies and 84 billies were captured and equipped with VHF or VHF and GPS collars. Data were collected during capture to assess nutritional status, diet composition, genetic identity and the presence of any diseases. Genetic analysis indicated the study area includes three genetically distinct sub-populations divided by marine waters and low-elevation river valleys. While goats are well-adapted for winter conditions, researchers found that winter snowfall is a significant factor on survival and goats were negatively influenced by winter severity. Estimating survival and reproductive rates represented a primary objective of the studies, as such data are crucial for sustainable management and conservation of species. Forty eight brown bears were captured between 2006 and 2010. Researchers recorded movements and habitat selection for 30 brown bears using GPS radio collars. Male bears on average had home ranges of 555 square kilometers (344 square miles), four times larger than the females. One interesting finding regarding the brown bears is that these bears den and hibernate at much lower elevations than many other Southeast Alaska bears. Regional research coordinator Rod Flynn, the principal investigator on the project, said the average elevation for dens was about 201 meters (660 feet), and the highest den was located about 243 meters (800 feet) above sea level. Brown bears on nearby Admiralty, Baranof and Chichagof islands den in the alpine, 762 (2,500 feet) above sea level. Regarding habitat selection, typically, these bears stay in the valleys and river bottoms, Flynn said. In contrast, wolverines tend to stay in the mountains and don’t go into the valleys very much. Moose were not historically found in the Berners Bay area, and were introduced in 1959 and 1961 from populations in Southcentral Alaska. Descendants of these moose have established a population in the area. Sixty seven moose were captured, examined, and equipped with VHF or VHF and GPS collars. Documenting moose movements throughout the year enabled determination of preferred habitat and movement and migratory patterns. One cow moose moved seasonally out of the Berners Bay area into Echo Cove at the end of the Juneau road system, and occasional sightings created local excitement as moose are very rare in the Juneau area. Later, genetic testing conducted by Kevin Colson (University of Alaska Fairbanks) determined that this was the only moose captured in the Berners Bay system that had a unique genetic profile. Hair and tissue samples were taken from all captured animals, but bear hair samples were also collected unbeknownst to the donors – using hair snares. These are essentially strands of barbed wire that snag hair from passing animals. These provide important genetic information that offers insights into how much the animals in one population mix with other populations – either through immigration and emigration, or simply passing through during breeding season and mating. Isolated populations that don’t mix much become genetically distinct. Brown bears in the Berners Bay area are nearly demographically isolated and form a unique genetic cluster with very limited intermixing with neighboring bear populations. Genetic data collected from the hair snares also was crucial for estimating population abundance. The core of the Berners Bay study area. Stable isotope analysis of hair, blood or tissue allows researchers to determine the percentage of marine or terrestrial based food in an animal’s diet. That’s perfect for biologists wondering how much salmon bears eat in proportion to other foods, like moose or terrestrial vegetation. One surprise is that Berners Bay area bears are eating fish even before salmon runs start. The data doesn’t reveal the type of fish; likely candidates are sand lance, capelin, eulachon or herring. “The marine signature is very strong in bears captured in early July,” said Flynn. Stable isotope analysis of animals such as Sitka black-tailed deer enables biologists to look for those signatures in predators or scavengers, and assess the degree to which those animals appear in the diet of an animal like a wolverine. Researchers found that wolverine diets on average consisted of about 27 percent deer and 17 percent large ungulates (moose or mountain goats, and ungulates are most likely scavenged), 21 percent grouse, 12 percent ptarmigan, 10 percent mountain rodents (likely marmots) and a small percentage of conifer-eaters such as beavers and porcupines. Since deer are not typically found in Berners Bay, it’s likely the wolverines spent substantial time south of the area where pockets of deer are more abundant. The primary purpose of the research was to gather data to learn how to manage wildlife populations should the road be built. A secondary purpose was to recommend improvements to road design that could minimize impacts on wildlife. In some cases, direct impacts, such as vehicles hitting moose or goats, create a hazard that is heightened considerably in winter. Concerns about effects of the road on wildlife include the road construction, the presence of the road and traffic, and the substantially increased access to the area. A key concern is increased, unregulated and dispersed traffic throughout the area by off road vehicles. “The road would be a major impact for certain species,” said Flynn. 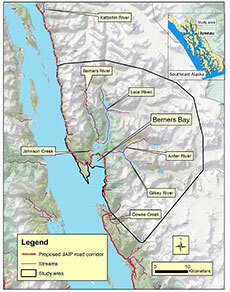 Certain areas along the proposed road route, particularly in the Berners Bay estuary, were crossed extensively in the early summer by bears pursuing emerging vegetation and mating opportunities, and in the late summer and fall by bears looking for salmon. The road corridor also bisects important moose habitat. While mountain goats spend summers high in the mountains, in winter they descend to elevations as low as sea level. The proposed road crosses migration routes and in runs through important winter range. Flynn said biologists are still analyzing data from the study, especially regarding bears and wolverines. Research on mountain goats and moose is scaled back but ongoing. Some of the VHF collars on animals will continue to function for up to a dozen years. “Since we have such good baseline data on Berners Bay, it enables us to do other things in the future,” said Flynn. The Berners Bay project reports are available on ADF&G’s e-library web page. The virtual viewing page of the ADF&G website features a gallery of trail camera images, including five albums of photos from the Berners Bay project. See the galleries labeled logtrap series, live trap camera, dead goat cam, dead moose bear, and wolverine and bear. Dead moose bear has an image of a collared wolverine.